Enhance your home's best features. 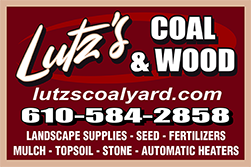 At Lutz's Coal Yard in Schwenksville, Pennsylvania, we offer bulk materials such as: mulch, soil, and stones. Landscapers/Contractors inquire about bulk and pre-season discounts. We offer topsoil compost and assorted stones for customers to choose from enhance the look of driveways and patios, while the screening stones are used for putting under patios. Contact us to turn your backyard into a beautiful garden with our assorted bulk materials.